Greenheck Model SP ceiling exhaust fans now exceed Energy Star 4.0 requirements providing increased airflow with decreased power consumption and sound. 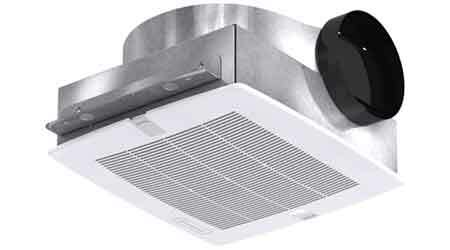 Compact in size, Model SP ceiling exhaust fans are designed for the lowest possible sound levels and offer a wide range of performance making them ideal for multi-family housing, hotels, hospitals, schools, storage rooms, and bathroom ventilation applications. All SP fan models are licensed to bear the AMCA Seal for Sound and Air Performance and are UL/cUL Listed. Products that earn Energy Star prevent greenhouse gas emissions by meeting strict energy efficiency guidelines set by the U.S. Environmental Protection Agency and the U.S. Department of Energy.